Actress turned director Sarah Polley’s first feature, Away From Her, surprised many people by focussing on the relationship between two elderly people rather than, as one might expect, characters closer to Polley’s own age. It earned Julie Christie an Oscar nomination for her work as the Alzheimer’s-afflicted wife, and my only quibble with that is that Gordon Pinsent, as her husband, should have been equally recognised. 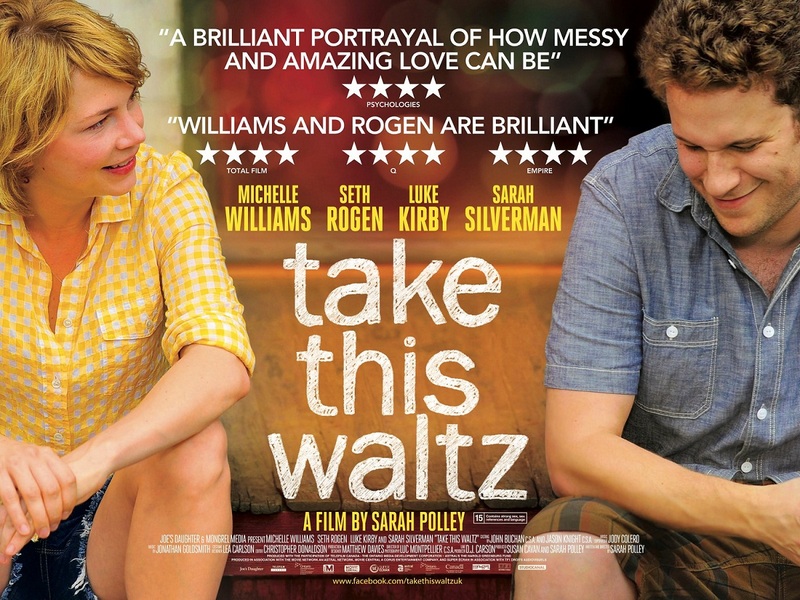 In Take this Waltz, which she both wrote and directed (Away from Her was based on a story by Alice Munro) Polley focusses on younger characters, but the subject is again a marriage that appears to be in its final stages. Michelle Williams stars as Margot, who has been married to Lou (Seth Rogen) for five years. Lou is a nice man, their marriage is comfortable, but perhaps too much so; for when Margot meets Daniel (Luke Kirby) on a work trip, they are immediately attracted to each other. And when it turns out they are actually neighbours, temptation starts to seem irresistible. In an early scene between Margot and Daniel on a plane, Margot talks about her paralysing fear of airport connections: she hates being between places, apparently, so much so that she needs to be ferried between planes in a wheelchair. I was slightly distracted by the big neon sign that said “Metaphor!” flashing persistently in the corner of the screen throughout the exchange… or did I just imagine that? Anyway, it’s a ham-fisted bit of writing, and thankfully the film does not descend to anything quite so clumsy again, though a few moments come close. Several of the best scenes play out without dialogue, including a scene of Margot and Lou swimming, a visit to a funfair, and a montage near the end (to Leonard Cohen’s title song) which includes a couple of bits that widened my eyes for a moment. The best thing about the film is Michelle Williams. It’s hardly a surprise by now how good she is, but she does a terrific job at making Margot likeable – no mean feat, given some of the character’s behaviour and apparent difficulty with self-awareness. Rogen is also very good. The film looks pretty as well, though you wonder how the characters can afford to live in the large houses and apartments they do. It’s unfortunate that the script sometimes feels the need to spell things out, as the film is far more eloquent when things are left unspoken. Indeed, the ending is nicely ambiguous – is Margot actually any happier, or has she just managed to distract herself from her underlying problems? While it suffers slightly in comparison to Polley’s previous film as writer/director, this is a romantic drama that pleasingly tries to avoid the pat answers usually found in plots of this nature. This entry was posted in Reviews and tagged Michelle Williams, Sarah Polley, Seth Rogen, Take this Waltz on August 5, 2012 by Gareth Negus.